Fair warning: This kind of grandeur and impeccable service could be habit-forming. This part of Beaujolais sounds like a fairy tale—the "region of the Golden Stones"—and when you arrive at the venerable Château de Bagnols, its massive honey-colored stone walls nearly aglow amid vibrant green vineyards and stately gardens, you may feel you have walked into something ethereal. 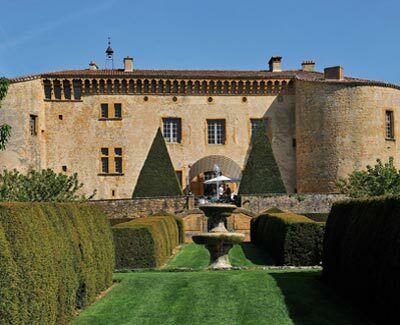 There are stories aplenty whispering from every corner of the château, which was built in 1217 and endlessly expanded and improved over the eight centuries since. But these are real stories, not fairy tales. Elaborate painted wall designs and a column bed in the Madame de Sévigné room evoke the style of the late 17th century, when that noblewoman stayed at the château on her way to Lyon. Narrow openings in the walls of the Pierre Roy and Les Seigneurs d'Albon suites, among others, reveal where 14th-century archers once stood to defend the castle. Rather than being clustered in one spot, the highly individual guest "apartments"—each furnished with 17th- and 18th-century tapestries and antiques—are tucked away in various parts of the chàteau, from the main residence to the tower that once held the drawbridge mechanism, even to the former granary above the stables. The sense of drama, past and present, continues in the public spaces. Enter the magnificent Salles des Gardes, and you can admire Charles VIII's coat of arms (commemorating the monarch's visit) carved above the enormous Gothic fireplace while savoring the restaurant's famous Bresse chicken and other Beaujolais specialties. Be sure to visit the Cuvage for a fascinating overview of the chàteau's wine-making history and to sample some recent vintages under the guidance of expert oenologists. Or perhaps you'd care to cross the now-dry moat and make a grand tour of the formal gardens and the cherry orchard—keeping in mind the delightful prospects of lounging by the Roman-style (but quite modern!) heated pool, settling into an inviting rocking chair beside the fragrant lavender alley, or letting yourself be pampered with a luscious catered picnic under the lime trees in the Salon Ombrage. Is there anything else you desire? Just ask—the château's staff can organize anything from a hot-air-balloon ride to horseback riding to a customized driving itinerary of the surrounding wine region and its historic sights. The seigneurs of centuries past could not have been treated better.